Posted on August 7, 2017 February 14, 2018 by Heather W.
Summer is a time of sunshine and outdoor celebration, but it’s also a time of heat waves and soaring temperatures. Responsible pet owners like Maryland Puppies Online want to make sure your puppy stays safe in your new home during the heat, which is why it’s important to recognize and prevent heatstroke in your new pal. 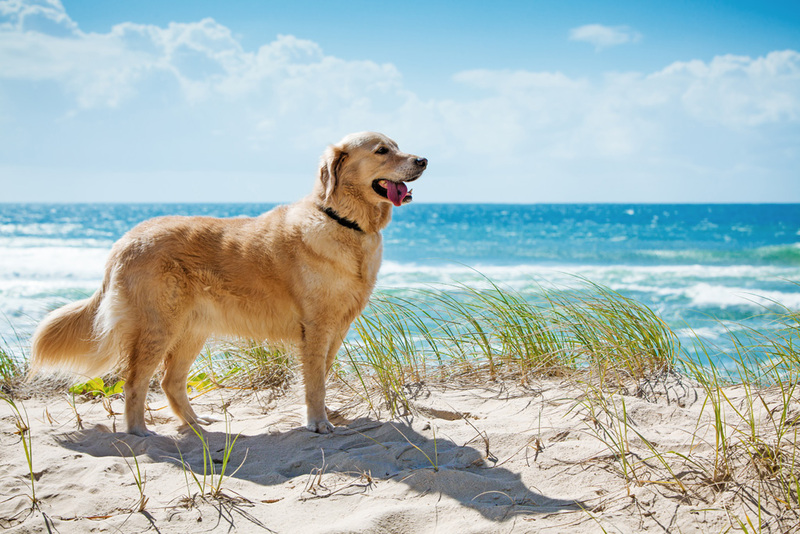 Caused by excessive heat and dehydration, canine heatstroke is characterized by heavy panting and rapid heartbeat and can lead to seizures, unconsciousness, and even death. Certain breeds are also more susceptible to heatstroke including boxers, pugs, and Shih Tzus (short muzzled breeds) too. Here are some important suggestions and safety tips to keep your pup safe and cool this summer. Car temperatures can soar in the summer. While most people know that super hot temperatures are a bad time to bring the dog in the car, most people don’t realize that even moderate temperatures can have dire consequences too. On 78-degree day temperatures in shade can quickly exceed 90 degrees, reaching up to 160 degrees for a car in the sun! And that’s not all. Even when the outside temp is in the 60s, the greenhouse effect of a closed car can still reach dangerous temperatures. If you must travel with your puppy during the summer heat, make sure you always keep drinking water on hand. Use your air conditioner, and don’t leave the dog unattended in the car. Puppies need regular walks. As both physical exercise and behavioral training, walking is fantastic for your pup, but consider skipping this during the extreme summer heat. Dogs don’t wear shoes (usually), so the pads of their paws make direct contact with the pavement. Pavement can become excessively hot during the summer. Just check out this Arizona resident cooking a steak outside on the asphalt. While puppy paws are designed for exercise, they aren’t’ tough enough to withstand cooking on a hot sidewalk. Try avoiding walks during the midday sun, instead of going outside closer to sunrise or sunset. If you have a yard, play fetch on the grass instead. Test hot pavement before walking by placing the back of your hand on the cement for five seconds — if you can’t handle it, neither can your pup. Another listed symptom of doggy dehydration is depression. Since it can be difficult to ask your pet if they are feeling down, try offering a favorite toy or treat. If this does not generate a reaction, it may be time to worry. Another test is to lift the skin from between your dog’s shoulder blades. If properly hydrated, this skin should quickly snap back into place. If you suspect dehydration or overheating in your pet, work to get them cooled and rehydrated quickly. Offer small sips of water or ice cubes, so as not to overwhelm their system. Bathe your dog in cool, but not cold water. Apply ice packs to the neck and move your animal into a shaded and/or air conditioned location. If you suspect your dog is suffering from heat stroke, contact your veterinarian immediately.